Okra is a well known vegetable and is grown in almost all parts of the world. It is commonly known as ‘Lady Finger’ (or Bhindi in India) and is rich in many nutrients. It is very healthy for the body and you can prepare it in many ways to make it tasty. It belongs to the mallow family and it is cultivated in warm and temperate climates. Other than using it as a vegetable, you can also consume its juice. If you want to improve the health of your skin, one of the best ways is to consume okra juice regularly. This is because okra juice contains antioxidants that help in purifying your blood and reduce acne and other skin problems caused as a result of impurities present in your blood. This way you get a clear and blemish free skin. 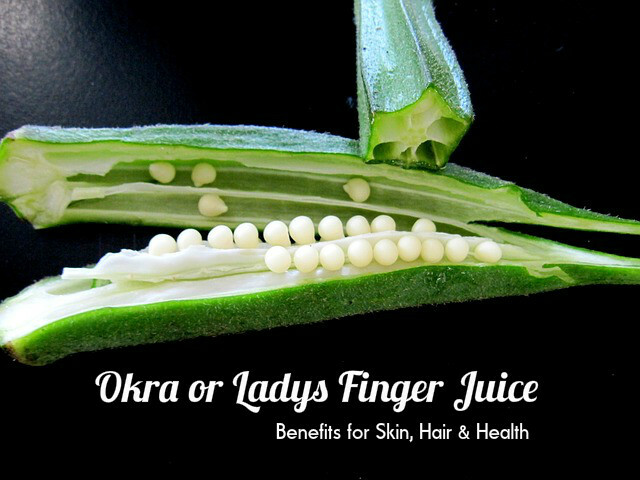 Okra juice is also good for providing you healthy hair. Boil okra with water and apply the transparent mucilage that you get on your scalp and hair. This helps in providing you bouncy hair. You can also use this mucilage as hair conditioner. Wash your hair with water and squeeze out the excess water. Now apply the mucilage on your scalp and hair and wash it off with water after sometime. It also keeps your hair and scalp moisturized and shiny, as well as free from dandruff. If you are suffering from anaemia, drink okra juice regularly. This can benefit you a lot. Okra juice is great for helping the body produce more red blood cells. This way it helps in treating anaemia. The juice of okra is rich in vitamin A, Vitamin C, magnesium and so on. All these help in the production of more red blood cells in the body. Lady Finger is said to contain insulin like properties, which makes it great for treating diabetes. By drinking okra juice regularly you can reduce the level of sugar in your blood. This way you can control diabetes. It is the immune system that helps you to fight against various diseases such as clod, cough, flu and so on. Okra juice is rich in Vitamin C and antioxidants. This makes it very effective for improving your immune system. So, consume okra juice regularly and enhance the activities of your immune system. Diarrhoea is one of the problems many people suffer from. It can lead to the loss of huge amount of water and essential minerals from the body. This can make you dehydrated and weak. Drinking okra juice is good for the treatment of diarrhoea. It also helps in replenishing the body. Okra is rich in fibre. This helps in lowering the levels of cholesterol in the body. So, by consuming okra juice daily, you can reduce the level of cholesterol and protect your heart from various heart related issues. Soluble fibre in okra is good for the treatment of constipation. If you are suffering from constipation, consume okra juice regularly. This will provide you relief from constipation. This is because the fibre acts as a natural laxative and binds with the toxins. This way it promotes proper movement of the bowel and provides you relief. Okra juice is very effective for reducing the asthma attacks. So, if you are suffering from asthma, make sure that you consume okra juice regularly. This will provide you relief. Okra juice is very beneficial for treating sore throat and severe cough. So, if you are suffering from these symptoms, consume okra juice regularly. It has antiseptic and antibacterial properties that help in treating cough and sore throat. Okra juice is also effective for making your bones stronger. The folate present in okra is of great benefit during the pregnancy for the mother and the child. It helps in increasing the density of the bones. As a result the bones become stronger and healthier. This way the chances of the occurrence of osteoporosis are reduces. As a vegetable, okra is a rich source of essential vitamins, antioxidants and minerals. These help your body to fight various diseases and also improve your immunity power. It is one of the top vegetables that you should consume regularly as it has lots of health benefits. Select smaller-sized okra instead of the bigger ones. They should be tender, crisp and not very fibrous. Wash well to remove dirt, insecticides or pesticides on them. Take 4 or 5 medium sized okra pods and wash them thoroughly to remove dirt and impurities. Now cut of both the ends of the pods and then split the pods in half or pierce each side of the pods with a knife. Place the pods in a large mason jar and cover the pods with water. In the morning you can squeeze the pods into the water to release the left over sap. Remove the pods and then drink the water. This juice is great for lowering the blood sugar levels in the body. It also has many other health benefits. Now that you know the benefits of okra juice, add it n to your regular diet and have a healthy body and skin.